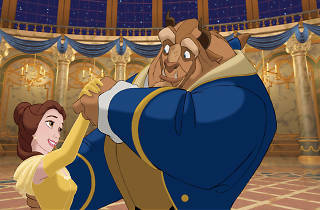 Disney animation enters the ’90s and embraces the stunning technical advances of computer-generated imagery — the sequence in the Beast’s ballroom is breathtaking — and updates the traditional dependent heroine. This Beauty, Belle, besides representing a move away from the usual Barbie Doll looks, is resourceful, bookish and vigorous in resisting the chauvinist advances of the conceited Gaston, the character who turns out to bear the true mark of the beast. Gaston was based on LA’s Medallion Man narcissists, and is well and truly lampooned in the bar-room waltz. Beast, based on a menagerie of brooding buffalo, bear, boar and gorilla, learns to master his temper, and his growing relationship with Belle is infinitely touching. His bewitched castle is enlivened by an antic household including a candelabra with the panache of a French maître d’, a neurotic clock and a mother-and-son teapot and cup. 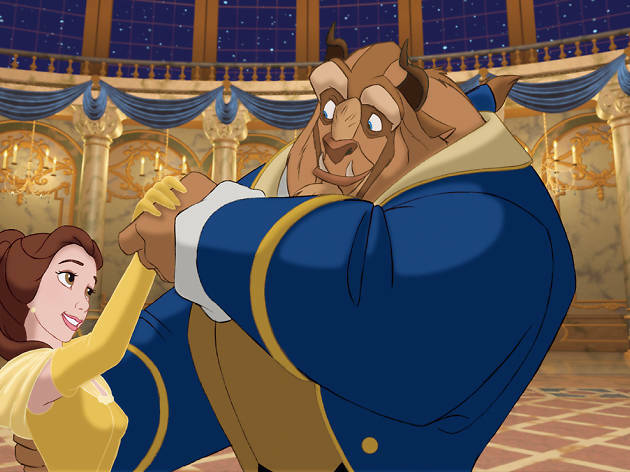 The six musical numbers from Howard Ashman and Alan Menken either reveal character or push the action, with ‘Be Our Guest’ an outstanding example of cartoon choreography. Gary Trousdale and Kirk Wise directed. Dazzlingly good and a treat for all the family.